At Eaton, we believe that power is a fundamental part of just about everything people do. That's why we're dedicated to helping our customers find new ways to manage electrical, hydraulic and mechanical power more efficiently, safely and sustainably, to improve people's lives, the communities where we live and work and the planet our future generations depend upon. Because that is what really matters. Eaton is a global technology leader in power management solutions with 2017 sales of $20.4 billion. Eaton has approximately 96,000 employees and sells products to customers in more than 175 countries. 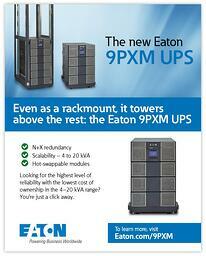 The new Eaton 9PXM UPS towers above the competition. It's a total game changer that can function as a tower or a rackmount, making it perfect for many applications. It has the highest reliability and the lowest cost of ownership in the 4-20 kVA range, making it an ideal pick. Interested in checking the new Eaton 9PXM UPS out? We have two models available on eAccu-Tech.com, our eCommerce website. Download your Education Solutions Brochure from Eaton Power.